MCCGP follows ISNA (Islamic Society of North America) and the Fiqh Council of North America's rulings to determine the beginning of the Islamic months including Ramadan and Eids. Based on this, we will observe Eid-ul-Adha on Tuesday August 21, 2018. There will be two prayers, the first at 9:00 AM and the second at 10:00 AM. Takbeerat will start at 8:30 AM. Please read carefully through the following important items which will help all of us in making this event a pleasant one. 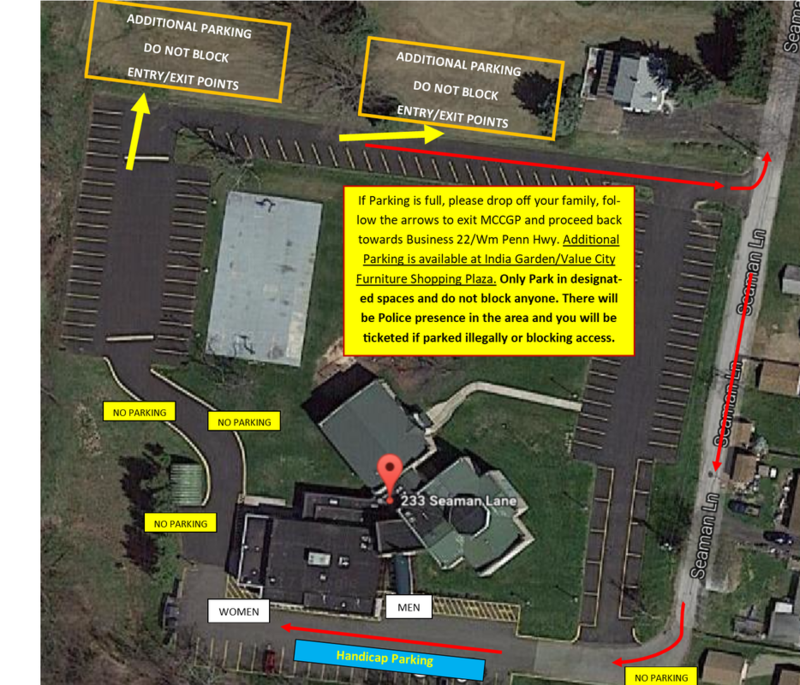 PARKING AT MCCGP: There will be reserved parking for various vendors at the MCCGP parking lot. Those spots will be blocked and clearly marked. There will be additional parking slots available for handicap parking as well and they too will be clearly marked (near the main entrance). Please observe these restrictions when you park. Volunteers will be available to help direct traffic. They will guide you to some open spots that are not typically used for parking. Please follow their directions. If they don't allow you to park at a location, there is a valid reason for it. Please do not argue with the attendants and proceed to overflow offsite parking after dropping your family off. If you arrive at the Center around 8:40, it is likely that the MCCGP parking lot is full and you can choose to proceed directly to the offsite parking facility. This will save you some time. Also, if you plan to leave immediately after prayers, please use the offsite parking facility. You may find the following map helpful. 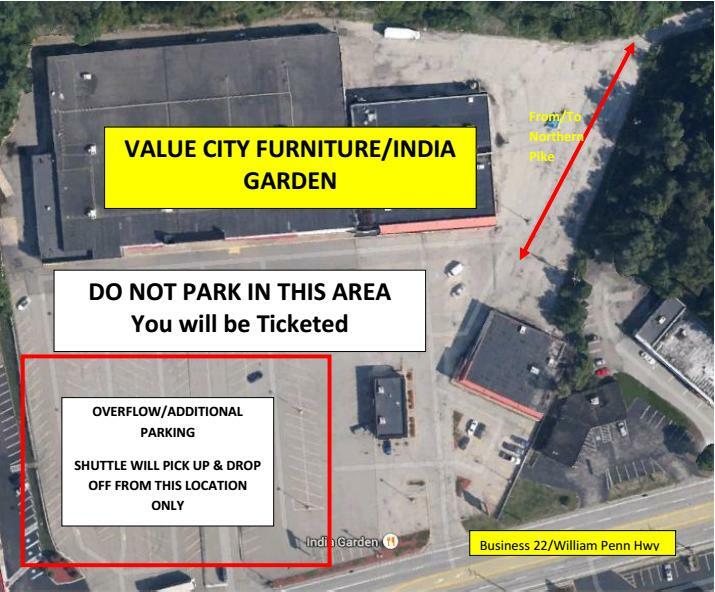 ADDITIONAL OFFSITE PARKING: Offsite parking will be available at the parking lot where Value City Furniture and India Garden are located. Please do not park near the storefront; park at the farthest end (see picture below). We have arranged for 3 Shuttles that will run between MCCGP and the offsite parking facility starting 8:00 AM in the morning. The shuttles will run until 1:00 PM and will give you plenty of time to enjoy the festivities at the center before you head back. Attendants will be available at the offsite location to guide you as well. Please follow their directions and seek help if you have any questions. UNAUTHORIZED PARKING: Please note that there will be police presence in the area and any vehicle parked illegally will be ticketed at owner's expense. MCCGP reserves the right to remove any vehicle that blocks the traffic or neighbors' driveways. DROP OFF: Attendants will guide you to the drop-off location where you can drop your family members off. Please use designated location only for this purpose. FIRST PRAYER: Brothers will pray in the main prayer area at both levels. Attendants will hand out plastic bags for your shoes. Please make sure you grab one for your shoes. Keep the bag with you. After the Khutba, you would exit from the designated doors at the front and the side. Please do not use the main entrance to the prayer hall for exit. Brothers praying on the second level will exit out of the school area from the back door that opens up near the Playground. Sisters will pray in the Social Hall. Their entrance will be from the doors at the back of the Social hall which will also serve as the drop off location for the convenience of sisters. During prayers, all should observe silence so each of one us can enjoy the most. SECOND PRAYER: Brothers and sisters will pray in their regular prayer space (downstairs for brothers and upstairs for sisters). They will also use regular exits after the Khutba. FESTIVITIES: As always, their will be food vendors and Kids entertainment at the Center. Food for purchase will be available from various vendors. Entertainment includes: Inflatables (obstacle course for kids 5 and up, Jungle Gym), Photo Booth, Mad Science for Kids and more. YOUR FINANCIAL GIFTS: Eid-ul-Adha is an occasion of happiness and gratitude. We hope that your experience at MCCGP on Eid is a memorable one. Without your financial support, we would not be able to offer key services that all of us benefit from. Please donate generously with the intention to please Allah (swt). Your gifts will go a long way in offsetting these expenses. No amount is small, give whatever you wish, but do so to gain the pleasure of Allah (swt). Click "Donate" button on top or here to start the process now. VOLUNTEERS: We are indebted to dozens of volunteers that offer their time and energy in preparation for, execution of, and cleanup for this event. Without their help, it would not be possible for all of us to experience the festivities of Eid. Please thank them when you see them and offer Du'a for them.